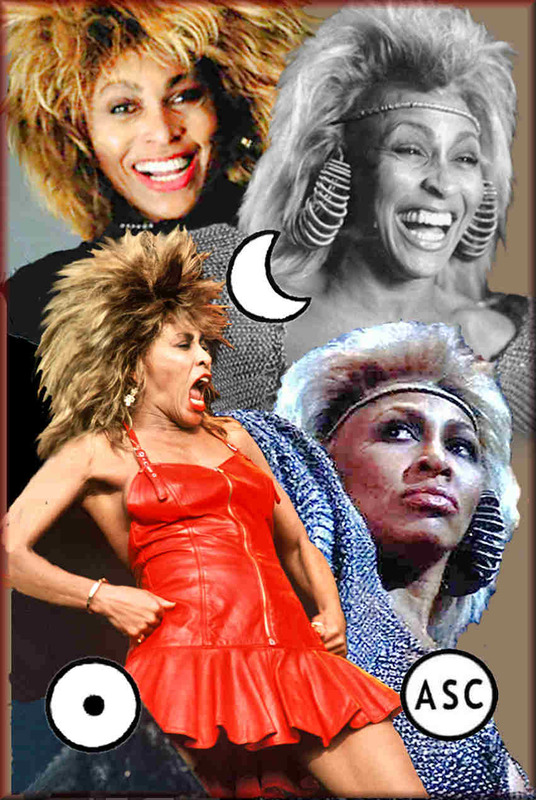 Tina Turner shows the personality traits of a Centaur thoroughbred. The animal nature of her sign becomes apparent when she gallops on stage, kicks the air, rears her head and tosses her reddish-hued mane. Tina has her Sun, Ascendant, Mercury and Venus in Sagittarius; Also Saturn and Pluto are in fire signs. bundle of energy! In addition, Jupiter and Neptune are placed in mutable signs. This makes her “wild-fire” even more restless and changeable. It’s no wonder her Sagittarius personality is wilder than normal. Tina clearly demonstrates how these abundant fire and mutable energies affect human expression. As she gyrates on stage, you may notice how the fires burn in a interweaving “Mobius” pattern. Any fiery outburst on one side of the body seems to be quickly reversed by a “back draft” which draws the torch to the other side of the body. These bi-cameral firings are most noticeable in the rotating movements of the body’s dual extremities—the hands, arms and legs. (They also can be seen in subtler facial expressions). A hand gesture on the right may shimmer and shake, then flare up in a countering left-handed surge of fire. A high step to the right is followed by a skip to the left. Any forward surge ends up moving to one side or the other, then to the rear. A upturned smile on the left raises the right eyebrow. Unlike the blowtorch of Aries or the concentrated heat of Leo, Tina’s fires divide and spread in all directions. Perhaps that’s why her energy seems inextinguishable. Along with these personality traits, Tina also shows many physical traits associated with Sagittarius. Note the high cranial dome, the long neck, the large thighs, the broad frontal teeth and the horsey eyes that slant upward on the outer sides. You may also notice that eyes seem to constantly twinkle. That electricity comes from Tina’s Gemini Moon. Watch Tina in any interview, and you will soon discover that she has a tendency to chatter. This is common for Gemini Moons. In the process, her hands will fly about, as she diagrams the thoughts in her head. This animated and mercuric energy becomes obvious, when she gets emotional. In the main photo collage at the top, the two upper photos show the mutable patterns of Sagittarius and Gemini. The right one (which is repeated here) captures one of Tina’s “moments of reaction”. Note how her lunar expression appears noticeably effervescent and and vaporous. Her Gemini Moon has eclipsed the intense fire of her Sun! The playful fires of Tina’s Sagittarius personality are rarely extinguished, but in non-expressive moments, the mutable forces of her luminaries are noticeably stilled, as they’re held in the fixed hearth of Tina’s Leo Ascendant. The fires are always cooking inside this fiery furnace. Since Pluto is the closest planet to Tina’s Ascendant, her persona is raw, magnetic and sensual. Physically, this mask gives Turner the cubical facial structure and the massive mane of a lion. The fixed fire of his showy theatrical mask becomes obvious, when Tina proudly struts onto the stage.